Yes, GeeXLab is back and it’s simply the new name of GLSL Hacker. I detailled the transition and the choice of the GeeXLab name in this article: Say Goodbye to GLSL Hacker and Welcome Back GeeXLab. GeeXLab is 100% compatible with GLSL Hacker and all prods and demos coded for GLSL Hacker will work directly in GeeXLab without changes. support of Direct3D 12 (pipeline state objects, command lists, hlsl, …). I will post an article on how to use D3D12 in GeeXLab shortly. Lua updated to version 5.3.1 (a new version 5.3.2 is out and I will update GeeXLab next time). More info about Lua 5.3 branch can be found HERE. basic support of reflections (reflection matrix, plane equation). touchscreen support added to the Raspberry Pi version of GeeXLab: it’s pretty cool to control a GeeXLab demo with the finger on the official Raspberry Pi 7-inch touchscreen display! 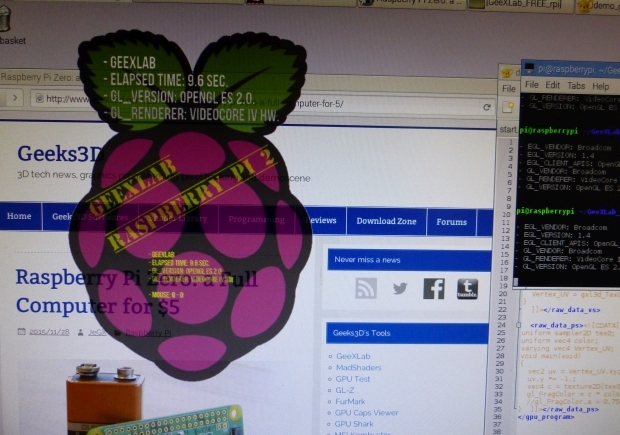 The opacity of the 3D window is now properly managed in the Raspberry Pi version of GeeXLab. GeeXLab’s website has been refreshed and a new blog is available for articles and new focused on GeeXLab. You can download the latest GeeXLab or the latest code sample pack from THIS PAGE. + added touchscreen support in the Raspberry Pi version. * first beta version of GeeXLab.
! Improved the Direct3D 12 renderer plugin. + added get_os_info() to gh_utils (lua).
! Lua engine has been updated to Lua 5.3.1. + added create_from_file_v3() to gh_gpu_program (lua). + Added first version of the Direct3D 12 renderer plugin. to gh_camera lib (lua / python). + added get_plane_equation() to gh_object lib (lua / python). + added rasterizer_set_ccw() and ccw() to gh_renderer (lua / python). + added apply_cmaa_intel() to gh_render_target lib (lua / python). + added set_max_compiler_threads() to gh_gpu_program lib (lua / python). and heman_generate_planet_map() to gh_texture (lua only). and set_depth_bounds() to gh_renderer (lua / python). designed to work with gh_renderer.get_capability_4i(). and mime modules that are defined by GLSL Hacker. + added clear_cpu_gpu_data() to gh_mesh. + added line adjacency support. + added particle_system_create_fluid_v2() to gh_physx3 (Lua / Python). + added do_screenshot_v2() in gh_utils lib (Lua / Python). * fixed a bug in params list of gh_utils.do_screenshot() in Python. * bugfix: the FreeImage plugin can now handle 4-bit per pixel images. keys even if the live coding box had the focus. there to enable live-coding on each script/glsl editor. + added new keys to keyboard management (all keys of numeric keypad) on Windows. + added experiemtal Spout plugin. Will GeeXLab become available for commercial use ? Paid version ? Last version of GeeXLab had SDK for embedding in our own application. Yes, a paid version (PRO version) is in progress. It comes with additional features (the most important is the binary export of the scene file, which can be read on a player) and more support. And an easy-to-use SDK will be also available to embed the GeeXLab engine in your application.